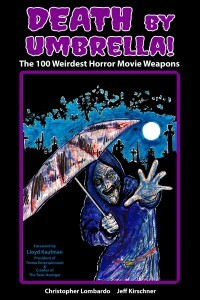 When I first heard of Death By Umbrella: The 100 Weirdest Horror Movie Weapons, I thought, “What a great concept!” Much of the joy from horror movies, especially when watching with friends, comes from seeing ever more inventive and bizarre kills. We all probably have a particular favorite from the big franchises like Nightmare on Elm Street and Friday the 13th. The sleeping bag scene in Friday the 13th Part 7 or the eye gauge in Zombi 2 might be mine. This book goes beyond those franchises covering classics and movies you may never have seen or even heard of. Our authors Christopher Lombardo and Jeff Kirschner set out to give us some of the best! When dealing with such a crazy topic it’s only fitting that Troma’s Lloyd Kaufman provides the foreword and it’s funny and fitting. The deaths discussed are divided into seven categories. We have death in the home, in the kitchen, deadly machinery, sports and recreation equipment, art related deaths, death by squeezing and finally good old skewering. Each chapter also includes a few black and white stills. You’ll find weapons ranging from a pogo stick to a vending machine and everything in between. For each death scene we get a bit of an introduction about the film and then a set up to the scene. This is really entertaining and often amusing. It’s like having all the best bits cut together in one film, except this is a book, but you get what I mean! This book is like a greatest hits album with just the good kills and without the boring other stuff. Thanks to the magic of YouTube there are lots of clips just of kill scenes from movies so if you find one you want to see, for the most part, you can. You would definitely not want to sit through some of these movies in their entirety. You do have to be aware of spoilers, so if you think you want to watch a film, best not to read about the scene in case more of the plot is given away. This might be the perfect bathroom book. The only thing missing that I would have liked is an index so you can just flip to a certain movie or kill.